Did you see and hear Sally Gunnell OBE discussing the health and wellbeing of our children on Sky News and national radio stations this month? On Tuesday 9th Jan, as part of National Obesity Awareness Week, Olympic gold medallist Sally Gunnell OBE was rallying schools to implement a healthy change in 2018, ensuring that children are receiving the vital food education they require while at school. As a continued Premier Wellbeing supporter, Sally Gunnell was more than happy to represent Premier in the news. Sally is extremely passionate about family’s and children leading a healthy lifestyle, and believes food education should be mandatory in our schools. Over two fifths (46%) of parents surveyed by Premier Wellbeing, find that a lack of time makes living a healthy lifestyle difficult for their family. Almost a third (32%) blame the cost of healthy meals for the family and 1 in 5 (20%) blame their own careers and jobs. Surprisingly 1 in 5 parents said their child’s school doesn’t teach something related to health education, such as healthy eating or staying active. The Sally Gunnell campaign was developed to raise awareness of Premier’s Wellbeing programme, incentivising leads for our franchisees to develop new relationships within their territories. Premier have also followed up with schools directly with social media and email campaigns, and a Wellbeing pack delivered to nearly 3,000 schools. The campaign was a significant investment from Premier HQ for their franchise network. Through utilising world-class press contacts and ambassadors, Premier can deliver messages on a national, and global scale. Working with the national governing body for fencing, British Fencing, Premier and Birmingham-area school children have officially become Guinness World Record holders, for the largest fencing lesson ever held! On September 27, 2017 at Rockwood Academy in Birmingham, Premier—best known as the owners of Premier Sport—in partnership with British Fencing, activated 300 children to break the world record for the largest fencing lesson ever! In order to break the world record, the lesson had to last for 30 minutes and exceed 250 participants. To make sure that there could be no doubt, 300 children from CORE Education Trust schools, Rockwood Academy and Nansen Primary, joined in the fun with sabres in hand and a smile on their faces for 45 minutes on National Fitness Day, a nationwide event organised by ukactive that encourages adults and children across the UK to get moving. The record attempt saw Premier team up with British Fencing, providing skilled tutors that instructed students in the basics of fencing, a sport which works to increase coordination, precision and decision-making skills. Attending on the day was Ben Peggs, one of the country’s leading fencers. Ben was an inspiration to the children and his enthusiasm for the sport he loves was clear to see. For Premier, becoming World Record holders helps to further the goal of Educating and Activating the World through physical activity. Premier are the largest provider of physical activity in the UK, offering courses and clubs helmed by highly-qualified professionals that take place inside and outside of school hours. These opportunities provide children the chance to engage in physical activity centred around sport, performing arts and wellbeing, ultimately fostering healthier lifestyle choices. On Friday, 3rd November at Emirates Stadium in London, Premier officially unveiled its new brand and vision to a crowd of staff, franchisees and special guests. Our new mission: to Educate and Activate the World. Premier CEO David Batch kicked off the event with a presentation introducing the company's new brand and direction. In addition to gaining a new logo and a more modern feel, we've shortened our name down to just Premier – it's easily recognisable, and encompasses all of the products in the Premier family. These changes will help usher Premier into the future, as the organisation continues to expand across the UK and internationally into the United States, India and China. Another exciting announcement on the agenda was the addition of Olympic Gold Medallist Duncan Goodhew MBE to the Premier team. 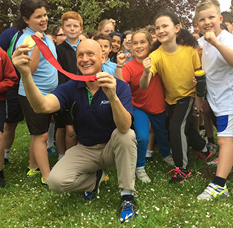 A legend in the UK sport world and beyond for his achievements in swimming and promoting physical activity, Duncan has served for many years as a Premier Sport Ambassador and Premier Education Group Director. Now, he'll officially join us as Chairman. The event was capped with an auction for Premier Foundation, our charity in which we provide physical activity opportunities for disadvantaged young people. On the auction block were Club Wembley FA Cup Final tickets, a signed tennis ball by Andy Murray and other coveted sport memorabilia, overall raising an incredible £1,612 that'll help support the vital work we do and the children that need it. In the audience helping us celebrate these new strides were Premier staff, franchisees and external stakeholders, including Sport England, ukactive, British Gymnastics and England Handball. Everyone was invited to take part in an Emirates Stadium tour, where they got to see up close where Arsenal take to the field. With a new brand and hit event under our belt, it's clear Premier's future is brighter than ever. We're on our way to Educating and Activating the World, inspiring kids to get physically and setting them up for a healthy lifestyle – and there's still time to join us. On 13th October 2017, Premier were awarded the Franchise Marketing Award for Best PR Campaign for their efforts with The Golden Mile and data surrounding UK children's inactivity. The official awards ceremony, sponsored by Business Franchise magazine, was held at the National Exhibition Centre (NEC) in Birmingham. Premier's award-winning campaign used extremely compelling data gathered by The Golden Mile that revealed a large number of UK parents are concerned over their children's inactivity. The study showed that 75% of parents admit their children are less physically active than they were at a similar age, while the same percentage admitted they don't actually know how long their children need to be active each day in order to maintain a healthy lifestyle. This data all comes in light of studies that reveal this generation of children are believed to be the first to have a shorter lifespan than their parents, due largely in part to sedentary lifestyles. With the help of former Olympian Dame Kelly Holmes, who was invited to speak about the data and The Golden Mile on the BBC, Sky Sunrise and the Chris Evans Breakfast Show on BBC Radio 2, the campaign reached an incredible audience of more than 50 million viewers and listeners. In addition to Dame Holmes' appearances, the campaign was picked up by The Daily Mirror and The Sun, plus a number of regional BBC radio stations and beyond. The coverage serves to not only bring awareness to the urgency of combatting UK children's sedentary lifestyles, but to also draw attention to The Golden Mile and how this health initiative can inspire children, parents and participating school staff to engage in physical activity. Premier was incredibly excited to have run such a successful campaign, and were honoured to have received the award – especially one so prestigious. The Franchise Marketing Awards are considered some of the most highly-respected accolades in the franchise industry, and were judged by an independent panel of market experts. On Friday 7th July Sally Gunnell OBE visited Pakefield Primary School, Norfolk, to deliver an inspiring whole school assembly and classroom visits to help support Premier’s health and wellbeing programme. Pakefield Primary school have become Premier’s flagship school, taking on all three wellbeing programmes (Play-Trition, Fun-Trition and Fit-Trition) to ensure a ‘Whole School Approach’ to health and wellbeing. Research from Premier last year discovered that just 10% of UK children are partaking in physical activity every day at school and only 25% manage an hour or more of exercise a day. Pakefield Primary is setting a shining example to schools nationally on how to live a healthy and active lifestyle. “Parents lead very busy lives, but we are facing a child obesity epidemic, so it’s vital that we do all we can to give our kids the best start in life. A positive approach to healthy living starts in the home, but there’s plenty the wider community, including schools, can do to support parents and ensure a joined-up approach to family wellbeing”. The scheme - thought to be the first of its kind anywhere in the UK - gives parents the chance to attend fitness classes at their child’s school straight after dropping them off, or just before picking them up. Participating schools are also given a 6 -12 week program to educate pupils on the importance of active, healthy lifestyles – a key part of the national curriculum’s focus on wellbeing. Premier delivers health and wellbeing sessions to Early Years, Primary Schools and adults, emphasising the importance of a whole school/family approach to health living. The programme tackles the obstacles that can deter individuals from participating in regular exercise, and helping them make healthier nutritional choices. Premier and British Fencing are delighted to announce an exciting new partnership that will see Premier Sport become the “Official Delivery Partner within Primary Education”. Working together, Premier and British Fencing will share knowledge and resources to better communicate the vast benefits of fencing to the body and mind to get more children active during and after school hours. Premier currently deliver weekly PE, Sport and Physical Activity sessions within 15% of all Primary Schools in England and one of the increasingly popular sports delivered has been Fencing. Fencing has been steadily growing as a recreational sport and it is now estimated that 30,000 people fence weekly, with figures set to soar throughout 2017. It’s one of a few sports that offers mental stimulation and improves children’s strategic thinking, attention and decision-making abilities and can help those with ADD and ADHD to focus. In May 2017, Dame Kelly Holmes represented the UK’s Number 1 sports and physical activity provider and franchisor Premier Education Group, for the launch of their new Golden Mile campaign. Dame Kelly spoke on Sky Sunrise, BBC and The Chris Evans Breakfast Show, to name a few, supporting the campaign that is targeting primary school children to be more active and healthy. The Golden Mile is a national initiative aimed at getting children doing regular physical activity, to tackle the alarming rise in childhood obesity. Children collectively walk, jog or run around a set course and schools are given the resources to track and monitor pupil progress. •	Children are spending almost double the amount of time a week on a tablet or watching TV, than doing any type of physical activity. The #GoForGoldChallenge sees schools compete against one another over a 4-week period to win prizes, ranging from Olympic Athlete visits to their school to free sports days and health and well-being sessions for both pupils and teachers/parents to enjoy. The campaign encourages schools to proactively increase the level of activity their pupils are undertaking while at school, whether it’s during a P.E. lesson or at an extra-curricular club. Golden Mile had 1,254 schools registered on the Golden Mile programme. Since Dame Kelly Holmes launched the new campaign in May, an additional 43 new schools have joined. Not only does this improve the health and well-being of nearly 10,000 children, it provides a new potential new revenue stream for the franchisees. If you’re inspired by the impact Premier make on children’s lives throughout the UK, get in touch with us today about becoming a franchise owner. On Tuesday 14th January Olympian and mum of three, Sally Gunnell OBE officially launched Premier Transition, the latest brand offering brought to market by Premier Sport. Sally took to national and local media, including, Sky News, the Chris Evans Breakfast Show and many more to highlight the importance Premier Transition has to play in developing healthy attitudes to life from an early age. Premier Transition has been in development over the past 18months, and is the third offering from Premier Sport to support the expanding network of franchisees. Transition not only services Premiers existing customers, but opens up new markets including adults and early years. The launch couldn’t have been more timely, with recent research showing Children across the UK are missing out on the best possible start in life because their parents don’t have the time, money or knowledge to help them lead a healthier lifestyle, a survey suggests*. Two thirds of parents polled by leading children’s coaching company Premier Sport say they don’t know enough to educate their children about healthy living, while 37% blame lack of time and 30% cite the cost of healthy food and gym facilities as a barrier. The survey also found that despite just 16% of children leading the healthiest lifestyle in their household, less than half of parents will be encouraging their children to get fitter over the next 12 months. Olympic gold medallist, Premier Sport supporter and mother-of-three, Sally Gunnell OBE, is shocked by the figures and says families need more support to get active if future generations are to stay fit and healthy. The former 400m hurdler was speaking as Premier Sport officially launched its pioneering Premier Transition program – a unique health and wellbeing initiative enabling early years support, nurseries, primary schools and parents to work together to improve family fitness. The scheme - thought to be the first of its kind anywhere in the UK - gives parents the chance to attend fitness classes at their child’s school straight after dropping them off, or just before picking them up. Participating schools are also given a 6-12 week program to educate pupils on the importance of active, healthy lifestyles – a key part of the national curriculum’s focus on wellbeing. Research from Premier Sport last year found that just 10% of UK youngsters are doing physical activity every day at school, while only 25% are managing an hour or more’s exercise a day. The Children’s Inactivity study also found that 85% of parents think their children would benefit from more education around fitness in school, while 60% are worried about childhood obesity levels. Premier Sport today published new research alarmingly revealing that only 10% of children are doing physical activity in every day, with over a quarter of parents believing their child is not doing enough and 60% are worried about obesity levels in their children. According to the research, 85% of parents think their children would benefit from more education around fitness and half of parents agree that children should be properly fitness tested in schools. - Only 10% of children are doing physical activity every day at school. - Over half of parents think that children should be properly fitness tested in schools. - 60% of parents are worried about obesity levels in children. - 85% of parents think their children would benefit from more education around fitness in school with 50% suggesting their children should be properly tested in school. - A quarter of parents admit they’re in the dark when it comes to knowing what physical activity their children’s school offer. - Three quarters of our children don't even do 1 hour a day of exercise. - A third of parents struggle to keep their children active. Addressing the concerns of the nation’s parents and their suggestion that the need for physical activity can begin at school, Premier Sport and ukactive joined forces to launch the ‘My Personal Best’ initiative, comprising of four fitness measures throughout the school year, with the aim of identifying periods when children become most inactive. Based on evidence from the programme, appropriate interventions are put in place to ensure children with the most need are targeted and any investment/impact can be measured, particularly for girls whose activity levels begin to drop from age seven, statistically continuing through their teenage years. 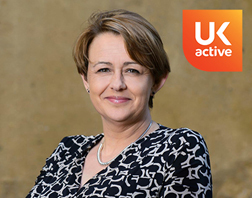 ukactive Chair Baroness Tanni Grey-Thompson (image below), said: “We know that today’s youth are the least active generation ever, so it’s vital that we intensify our efforts to embed a minimum of one hour of physical activity into their daily routines. “Central to this should be the nationwide rollout of fitness measurement programmes for primary school children that are conducted in a way that is fun and enjoyable for kids. How often do you meet someone and ask them how they are, and their response is “not too bad......” ? Just think about that response as it may sum up their mindset. I will explain with this comparison - by answering “not too bad”, for me, it suggests their glass is always half empty, and I immediately think 'blimey, just how bad are things'? Compared to if they answered - “I am good, and thank you for asking". My reason for highlighting this thought is that I regularly observe people who, without knowing it, are stuck in 'half empty mode'. People fascinate me. Only last week, I was at a hotel just outside of Oxford, and whilst waiting to meet a guy to discuss the Premier franchise opportunity, I couldn’t help but overhear a conversation between two gentlemen at the opposite table. For 45 minutes, the pair of them did not utter a positive word! From what I could gather, they were staying at the hotel as they were on nights with a construction company undertaking repairs to some large construction nearby. It got so bad at one point that one guy was reading out an email word for word from his phone and telling the other guy every reason the action would not work! In the end, I was itching to go over there and sign them up to the "Take the Brakes Off" course by James Ashford, where they would understand the power of responsibility, which is - “nothing is happening to me, everything is happening because of me”. My view on why they are sat there frustrated, hacked off, blaming everyone else, is that they approach everything from a negative viewpoint. It also reminds me of our Core Value #9 - remain above the line at all times. I think we can safely say that these guys would not fit in at Premier! The contrast could not have been greater when I met with the chap who is keen on joining Premier, and he was explaining what he has achieved over the last few weeks as part of his due diligence into starting a Premier business. As I listened and observed his positive manner, another Power Principle came to mind, which is The Power of Focus –whatever I focus on, I am going to attract and get more of. I leave it with you to decide whether he has the right Positive mindset to join Premier. I guess you are wondering what my response is when people ask how I am... my reply is “outstanding and giving off sparks!!!”. So here is my challenge to you for the next time someone asks you how are - respond with “unstoppable!” and see the smile on their face. I guarantee you will have a spring in your step for the rest of the day! If you share our positive mindset and can relate to our core values then visit our business opportunities page, where you can find out how you could contribute to our positive team spirit!